Info At the age of 44, Jonathan Weinzapfel has earned a reputation as an innovative mayor who has streamlined city government, attracted high paying jobs and built new partnerships to improve education in Evansville. Jonathan is one of six children. He grew up on a farm in Posey County, Indiana, in the southwestern corner of the state, where he spent his summers hauling straw and hay and his autumns harvesting corn and soybeans. He graduated from Reitz Memorial High School and Indiana University. After graduation, Jonathan worked as a sales representative for Eli Lilly and as an aide to Congressman Frank McCloskey in Washington. Jonathan returned to Evansville to work for Old National Bank. In 1999, he was appointed to fill out a term as a State Representative in the Indiana State Legislature and went on to be elected to two full terms. In the legislature, Jonathan worked on a variety of issues ranging from the environment to child labor to technology, forming coalitions and working across party lines. In 2003, Jonathan beat an incumbent to win the office of Mayor of the City of Evansville with 62 percent of the vote. In 2007, he was re-elected with an overwhelming and almost unheard of 85 percent of the vote. As Mayor, one of Jonathan’s top priorities has been to streamline government, delivering more services while holding the line on city budgets. Jonathan has delivered six balanced budgets, cut the city payroll by 40 positions while improving services, and found innovative ways to save money, such as the first ever joint purchasing agreement in the state with the Evansville-Vanderburgh County School Corporation and Vanderburgh County that allows the city, county and the school corporation’s purchasing dollars to go further. Jonathan has made Evansville a driving force in attracting good jobs to southwestern Indiana, resulting in hundreds of millions of dollars of investment and more than 1,400 new jobs. Mead Johnson Nutrition, American General Finance and Berry Plastics have expanded their presence in Evansville. Berry chose Evansville to be home to its new global headquarters. AT&T chose to locate their new call center in Evansville. Jonathan was also instrumental in forming the Economic Development Coalition for Southwest Indiana. The Coalition – which is comprised of representatives from Vanderburgh, Warrick, Gibson and Posey counties – is devoted to bringing new businesses to the region. Jonathan also helped create the Growth Alliance for Greater Evansville (GAGE), which is a unified city/county partnership dedicated to nurturing businesses and seeking investment opportunities in downtown Evansville. Jonathan has also focused his leadership on Education. Immediately upon taking office, he formed the Mayor’s Education Roundtable to bring community leaders together to work to improve education. The Roundtable has successfully tackled several initiatives including the creation of the Southwest Indiana College Access Network to help young people who come from families that don’t have a strong educational tradition pursue their studies beyond high school. The Roundtable has also helped spearhead the Early Childhood Development Coalition which works to ensure that all children enter school ready to learn. But perhaps more than anything, Jonathan believes in a collaborative style of government. One of his most successful initiatives is the Traveling City Hall Program. Each month, Jonathan and his department heads literally bring government to the people. They travel around the city to different locations, set up tables and sit and listen to the concerns and questions of the people they serve. Jonathan has also included citizens in policy making through the unique use of advisory boards that provide input about everything from the future of Evansville’s aging system of neighborhood pools to flooding problems on the City’s southeast side and what to do with the City’s more than 50-year-old stadium. Under Jonathan’s leadership, the National Civic League named Evansville an “All-America City” and America’s Promise named Evansville one of the “100 Best Cities for Young People.” In 2008, the Indiana Chamber of Commerce recognized Evansville as its Community of the Year. 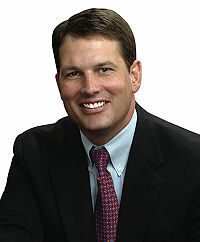 In addition to his bachelor’s degree from Indiana University, Jonathan holds a master’s degree from Georgetown University and a law degree from the IU School of Law in Indianapolis. Even as Evansville moves forward, it still remains true to its past, it is still a great place to raise a family, and that’s just what Jonathan and his wife, Patricia, are busy doing. Patricia grew up in Carmel, Indiana. She graduated from Northwestern University and is a former television journalist. Jonathan met Patricia when she interviewed him for a story. They have been married since 1996, and have three children, Nathaniel and twins Benjamin and Eleanor, and a rescue dog, a Collie mix named Addy. 05/05/2020 IN Governor - D Primary ?? ?